Windows Shell Tutorial by Cay Horstmann is licensed under a Creative Commons Attribution-Noncommercial-Share Alike 3.0 United States License. The operating system manages the resources of a computer, such as its internal memory, the disk drives, keyboard, monitor screen, mouse, printers, and network connections. People who use a computer to browse the web or play games have minimal contact with the operating system. Most of their time is spent with application programs. These users tend to use the operating system only to fix problems, for example with a failed Internet connection. The most recent versions of popular operating systems (such as Windows 8) have become very much oriented towards the consumer, hiding all but the most basic tasks from the casual user. Computer programmers have more advanced needs than people who use the computer as a tool. Programmers need to compile and launch programs and automate recurring tasks. This tutorial is written for programmers who are already familiar with the basics of using a computer. If you have prior experience using a computer for playing games or writing reports and are now learning to program, you will need to learn more about your operating system. Some students are reluctant to embark on this effort, either because they feel that they already know how to use their computer, or because they already have their hands full learning about programming. However, that is a short-sighted attitude. Without knowing the operating system, many common programming tasks seem tedious or even impossible. A command shell is not a good user interface for casual users. However, experienced users find that the command shell is indispensable for many tasks. Look at it this way. If you just want to snap vacation photos, you'll use a "point and shoot" camera. It requires no training and takes decent pictures. But if you want your photos to be published in a magazine, you will need a professional camera. You will need to spend time learning rather technical concepts such as f-stops and shutter speeds. We don't want to leave you with the impression that the command shell is the best tool for every job. Sometimes, you are better off using the GUI, particularly if you spend some effort learning how to use it efficiently. Just like a professional photographer chooses the best instrument for the job, you will need to learn when to use the GUI and when to use the command shell. In this tutorial, you will learn some tricks that make the GUI faster and more efficient, and you will learn the basics of the command shell. You probably know how to launch programs by clicking on the start button or on desktop icons. We will now introduce another method. Type the keyboard shortcut Ctrl+Esc. That is, hold down the Ctrl key, and, without lifting your finger off it, hold down the Esc key. Then let go of both keys (in either order). This keyboard shortcut simulates a click on the Start button. For a programmer, the first step ("grab the mouse") is the most painful. Programmers need to type a lot of code and therefore have their hands on the keyboard most of the time. In this regard, programmers are very different from casual computer users who have a hand on the mouse much of the time. You will see a popup menu, containing icons and names. The exact layout of the menu depends on the version of Windows and on the customization of the start menu. Here is one example. Your dialog may well be quite different. In any menu, you can quickly select items that have underlined letters in their names. For example, typing R is the same as selecting the Run item. Typing H is the same as selecting the Help item. NOTE: In some versions of Windows, the underlined letters may not show up until you hit the Alt button. Hit the R key now. You will get a dialog. Type the word notepad. In most dialog boxes, hitting the Enter key is the same as clicking the Ok button. Typing Esc dismisses the dialog, just as if you had clicked the Cancel button. Hit the Enter key now. The Notepad program launches. Which keystrokes are required to launch the Notepad program without touching the mouse? What is the advantage of using the Run dialog to launch the Notepad program? 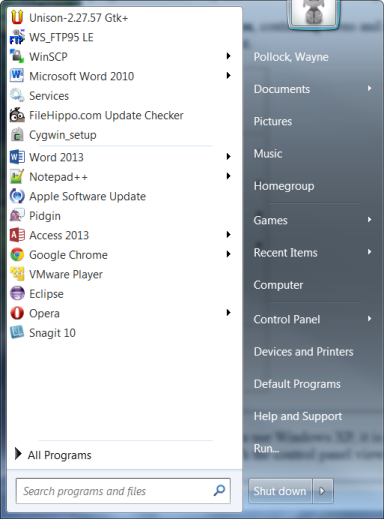 Hint: Locate the Notepad program in the start menu tree. In which submenu did you find it? How long did it take you to find it? Will it be in the same position on your friend's computer? The next step of this tutorial assumes that you currently have a web browser running. If you are reading these instructions from a printout, go ahead and start a browser. Close any windows except for the browser and the notepad window. You now have two windows on your desktop: the browser and the Notepad program. This is an extremely common situation for a programmer. You will often write a program in one window while consulting documentation in another window. It is essential that you can switch quickly between the windows, even if some windows hide others. The fastest way of switching between windows is the Alt+Tab keyboard shortcut. Press Alt+Tab now. You will get a dialog that lists all windows. Release both keys. You instantly switch to the next window. Start the calc(ulator) program (Ctrl+Esc R calc Enter). You should now have three programs running. Hit Alt+Tab again, but this time keep the Alt key depressed and repeatedly hit the Tab key. You toggle through the program icons. Let go of both keys when you have reached the browser program. Run three programs, for example, a browser, the notepad, and the calc program. Switch to the browser program if it is not currently active (either with the mouse or with Alt+Tab). Hit Alt+Tab and let go immediately. Which program is selected now? Hit Alt+Tab again and let go immediately. Which program is selected now? Why is the result surprising? Why is it useful? When the time has come to close an unwanted window, you can close it by clicking on the X icon in the top right corner, or you can use a keyboard shortcut. There are actually two shortcuts. The combination Alt+F4 closes the active window, but even keyboard enthusiasts will find it hard to remember. Select C to close the window. You can get a minimized window back onto the desktop by cycling to it with Alt+Tab. Suppose you want to see as much information as possible in your browser window. What keystrokes do you use to maximize the browser window? One of the most common operations for text manipulation is cut-and-paste: transferring information from one place to another. Because these operations are so common, there are special keyboard shortcuts for them. Switch to the notepad window. Pull down the Edit menu by typing Alt+E. Note the underlined E in the menu name. You pull down a menu by typing the Alt key and the underlined letter. Also note that the letters X, C, V are located next to each other, conveniently close to the Ctrl key (at least, on the standard English QWERTY keyboard layout). Now switch to the browser window. If it doesn't currently show a document, then visit your favorite web site. Use the mouse to select a phrase of your choice. Your task is to copy the selected text to the Notepad program, without further use of the mouse. What keystrokes to you use? NOTE: Many programs also support alternate keyboard shortcuts: Shift+Delete for cut, Ctrl-Insert for copy, and Shift-Insert for paste. However, these shortcuts are not as universally supported as Ctrl-X, Ctrl-C, Ctrl-V.
PageUp, PageDown (above the arrow keys) scroll the page up or down. This is often faster than using the scroll bars. You know that you can select text with the mouse, by clicking on the beginning of the text and dragging the mouse to the end. Indeed, that is often the fastest method. However, if you need to select a short amount of text and your fingers are on the keyboard, then it is useful to know a shortcut. Hold down the Shift key and move the arrow keys. You will see that a portion of text is selected. You can also use keys such as Home and End to extend the selection to the beginning and the end of a line. Switch to the notepad. It should still contain some text from a preceding exercise. If not, paste or type a couple of lines. Now highlight the entire line containing the cursor, using as few keystrokes as possible. What keystrokes to you use? It is handy to know how to move quickly through the fields of a dialog box without using the mouse. Type the Find what entry, then hit the Tab key to quickly get to the Replace with field. The Tab key is particularly handy for dialogs that have many text fields. When you use the Tab key to cycle through the dialog box, observe how the focus shifts from one field to the next. A text field with focus has a blinking cursor. A button with focus has a dotted rectangle around the button label. The focus tells you which part of the dialog box receives keyboard input. For example, if a button or checkbox has focus, then hitting the Space bar is the same as clicking it with the mouse. If an item name has an underlined letter (such as Match case), then you can type Alt together with the underlined letter to reach it quickly. For example, Alt+C is the same as clicking the Match case checkbox. Finally, most dialogs respond to two special keys. Typing Esc dismisses the dialog, just as if you had clicked the Cancel button. Typing Enter is the same as clicking the Ok button. Open up the Find dialog in Notepad. What keystrokes do you need to find the next occurrence of Hello, with Match case checked? Keystrokes only, no mouse! You now know the most common keyboard shortcuts. After a short amount of practice, you will probably agree that the keyboard is mightier than the mouse for many routine tasks. Occasionally, one needs to type accent marks or other special characters. There are several options for doing this on Windows, depending on the application you are using. When using the ALT codes, if the number shows a leading zero, remember you do need to type that zero. If you do your word processing in Word, there are some built-in shortcuts. For the letters with an accent mark, (áéíóú) first type Ctrl + ‘, then type the letter you want to have the accent mark. (That is, Hold down Ctrl and press the apostrophe key, then release them and press the letter you want). For the capital letters with an accent mark, (ÁÉÍÓÚ), use Ctrl + ‘, then Shift + the letter. The same technique can be used to type other accents. For the umlaut (üÜ) use Ctrl + :, then the letter (u or U). You can also use Ctrl + ` (the grave accent, or "back-tick"), Ctrl + ~ (tilde), Ctrl + ^ (circumflex). Other non-vowel letters can be accented when the accented character exists. For example, try Ctrl + , (comma), then the letter "c". The “Insert” menu (or the tab on the ribbon, if you have a modern version of Office) has an item for inserting special characters into a Word document. You can click on the symbol you want to insert, and that's it. First, select the font you are using. Different fonts support different sub-sets of Unicode. (That is, not all characters are available in all fonts.) Also, be careful of using Symbols or Wing-ding fonts, as they generally don't use the standard Unicode numbers for characters. The Character Map tool allows you to copy (and then paste) those characters into any document, even if you're not using Microsoft Office. If you need to type accented or other special characters frequently, you can “pin” the Character Map tool to the Start Button, or make a desk-top short-cut for it. Disk drives for computers come in two main types, removable (flash, CDROM) and non-removable (hard or SSD). In addition to the disk drives that are physically present in a computer, there may be several mapped drives that are provided by the network server. These are not actual drives at all, but look to the operating system (and to you) as though they are. The drives that hold the disks are named by a letter followed by a colon (“:”). The names a: (and perhaps b:) historically refer to the two the floppy drives early PCs had. The names c: and d: are usually used to name hard disk drives in that same computer. CDROMS, DVD and other removable media drives come next, labeled e: (or d: if there is only one hard disk), f:, and so on. Other letters like h:, s:, ... are mapped network drives. NOTE: In Linux/Unix/Mac OS X, there are no drive letters. Instead, removable-media drives are accessed through paths such as /mnt/cdrom or /media/flash. The look of the Explorer has changed greatly with different versions of Windows, and it can also be configured in many ways. Don't worry if your Explorer window looks quite different from this screen shot. Each drive contains files and directories (also called folders). 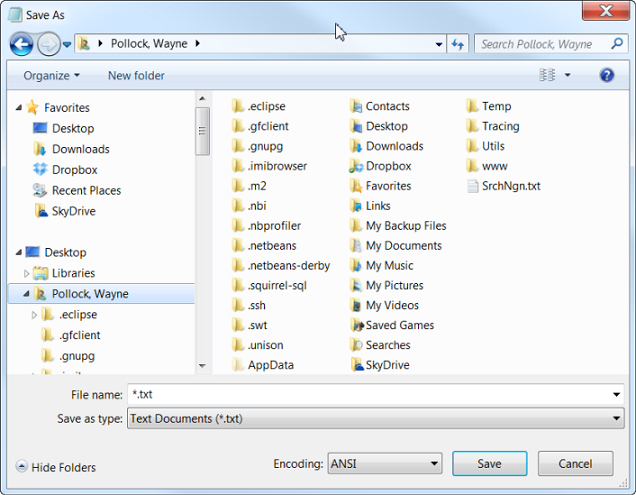 In the Explorer program, click on a drive to see the files and folders. The files are depicted with an icon that looks like a file folder. Files have different icons that depend on their type. A typical hard disk holds thousands of files. It is therefore essential to organize your files on the disk. As you accumulate files on a disk, you store them in groups by creating directories. Directories are also called file folders, or just folders. Generally, programmers prefer the term "directory", and we will use that term in this tutorial. Each directory can contain any number of files and other directories called subdirectories (or subfolders). This arrangement is known as a hierarchical or treelike directory structure. To visualize the hierarchy of directories, it is best to look at the tree view to the left of the Explorer window. Note that each drive has a small box next to it with either a + or - sign in it. This indicates whether the next level of the directory hierarchy is hidden or expanded. Click on the + icon to expand a hidden level, on the - icon to hide an expanded level. On each drive, the hierarchy starts with the root directory. The name of the root directory is simply the drive name followed by a backslash (such as c:\). The root directory contains files (such as c:\logfile.txt) and directories (such as c:\windows). 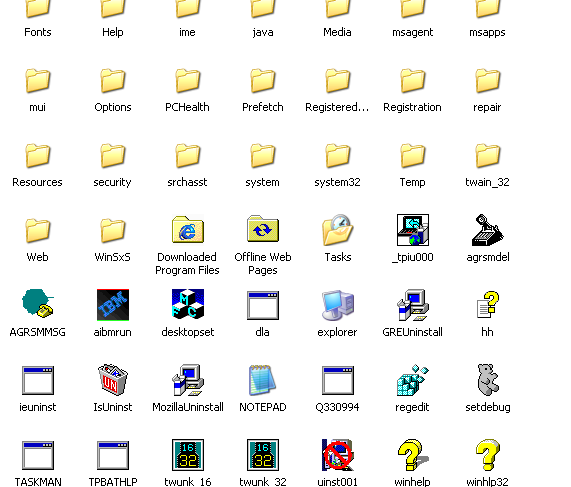 The windows directory contains other files (such as c:\windows\notepad.exe) and directories (such as c:\windows\system). The sequence of subdirectories from the root to a given file or directory is called the path. For example, c:\windows\system is the full path name of the system directory inside the windows directory inside the c: drive. List an additional file and an additional directory in the c:\windows directory. List a file and a directory in the c:\windows\system32 directory. Give the full path names for the files and directories. Find a file whose full path names contains at least four directories. NOTE: In Linux/Unix/Mac OS X, directories are separated by forward slashes (/). For example, /usr/local/java/bin. That is the same convention as for web page addresses. Only Windows uses backslashes (\). For this part of the tutorial, you need to find a directory into which you are allowed to place files and folders. On your own computer, you can simply use c:\, the root directory of the c: drive. If you work in a computer lab, you will need to find out the name of the directory that was created for your use. View your directory in the Explorer program. Select File -> New -> Folder (Alt+F W F). This command places a folder icon inside the directory and gives it the temporary name New Folder. It also leaves the cursor in the name field, allowing you to change it immediately. Hit Delete (or just start typing) to erase the name, and give it a new name. A good choice for a name is your own name, contracted to a single word without spaces (such as joe or jqsmith). If you use your own computer, create this directory now. From now on, place all files in this directory. If you use a computer in a lab and someone else has already given you a directory with your name (perhaps d:\jqsmith or c:\users\jqsmith), then you can skip this step. Create a subdirectory called tutorial inside the c:\yourname directory. (Substitute the actual directory that you created.) List all steps, starting with launching the Explorer program. (Close it first if it is currently running). You can use letters, numbers, the underscore (_) and the hyphen (-) character in file names. Obviously, you can't use symbols such as : and \ in file names, or they would be confused with drive and directory separators. There are a few other special characters that you can use, but the details depend on whether the drive is a local drive or a networked drive. It is best to avoid file names with exotic symbols such as !@#$. You can use spaces in file names, but programmers rarely do that, because spaces in file names create problems when you use a command shell. Instead, use - or _ to separate words: myproject-ver0.01.java or letter_to_fifi.txt. Both uppercase and lowercase letters are permitted in file and directory names, but Windows will not distinguish between names that differ only in the case of the letters. Windows remembers the case of the name when you first created it, and will always show it that way. But you can use upper- or lower-case letters freely when typing in the name. Create another subdirectory called TUTORIAL inside the c:\yourname directory. (Substitute the actual directory that you created.) What error message does Windows give you? What does it do after you click OK? Start the Notepad program: Ctrl+Esc R notepad Enter. Type a few words. Select File -> Save As from the menu. You will get the Windows "Save As" file dialog. The dialog suggests a file name *.txt. However, you can't actually use the * character in a filename. Also, the current directory is likely to be wrong. Fortunately, in most versions of Windows, the useless default is also highlighted, so you can overtype it. Simply type c:\yourname\. (Actually, type the name of your personal directory.) Type the letters s l o w l y and pay close attention to the entry field. You will see that a small menu below the entry field is filled with the names that match what you have typed at this point. This feature is a great time-saver. As soon as you see the name that matches what you want to type, hit the Down arrow button to select it. Presenting all choices that match the typed letters is called incremental search. Clearly, incremental search is a marvelous convenience because it minimizes the number of keystrokes. What choices do you get after you type the letter c (or whatever the drive letter of your personal directory is)? What choices do you get after you type c:\ and the first letter of the directory name? NOTE: Very old versions of Windows do not offer incremental search in the file dialog. Save the file as c:\yourname\tutorial\sample.txt. Be sure to supply the extension .txt. That extension signifies that the file is a text document. 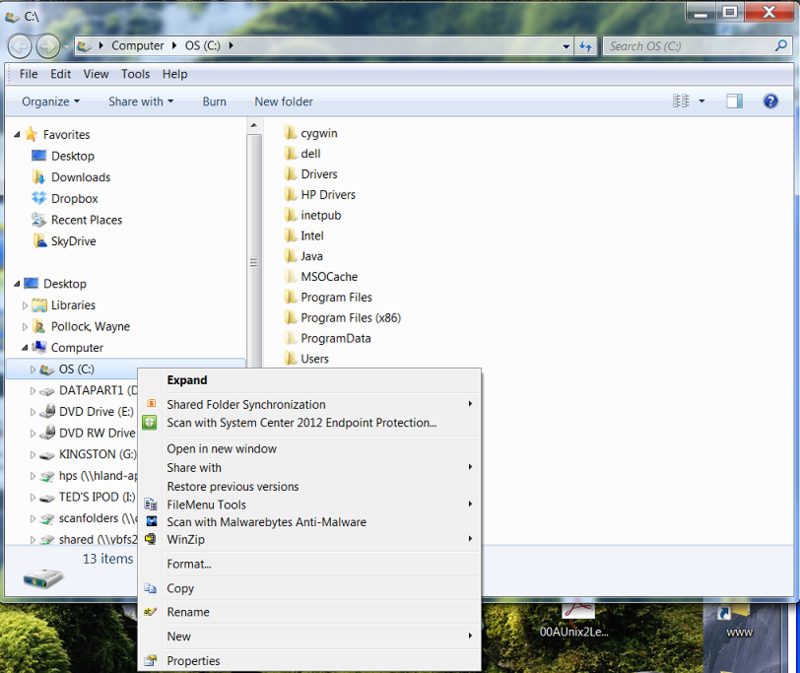 Close the Notepad program and locate the file that you just saved in the Explorer program. What icon does it have? What name is displayed for the file? What happens when you double-click on the file name? Your system has many settings, or options, you can change or adjust. These settings affect the appearance of windows, menus, the desktop, and other items. 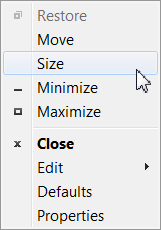 Settings can change the behavior of mouse actions, or the items that appear in context menus. By changing settings, you can customize or personalize Windows to work the way you want it to. WARNING: Changing some settings incorrectly can prevent the correct behavior of your system. Always be careful when changing settings! Change them one at a time, and make a note of the previous (working) value of any settings you change, so you can restore them later if necessary. Settings are changed in different ways, depending on the setting. You may find a program to change a setting, or use the control panel, or just find the setting in a menu someplace. The settings are all saved to one or another file on the disk, called the system registry. Depending on the configuration of Windows, file extensions such as .txt may not be displayed when you view the file you created earlier in Notepad, in the Explorer program. By default Windows hides the extensions, presumably because naive users are confused about file names such as letter to aunt tilly.txt. NOTE: Hiding extensions is primarily helpful for virus writers. Many Windows users have eagerly double-clicked on icons labeled something like prettygirl.gif, only to launch a virus program whose real name was prettygirl.gif.exe. As a computer user, you don't want the operating system to hide information from you. Fortunately there is a simple setting you can change for this. For Windows 7, fire up the Explorer program. Hit the ALT key if necessary to show the menubar, and select Tools -> Folder Options and select the View tab. Make sure the check box next to "Hide file extensions for known file types" is unchecked. Click on it if it is checked. Then click Apply. To make this change effective for all folders on your system, also click the "Apply to Folders" button. Then click OK. Make sure to repeat this step on every Windows computer that you use. Windows uses the file extension to figure out what to do with the file when you double-click on it. Double-clicking on a .txt file brings up Notepad. Double-clicking on a program file (with extension .exe) executes the program. You can find out which program corresponds to a particular extension and change that if you wish. 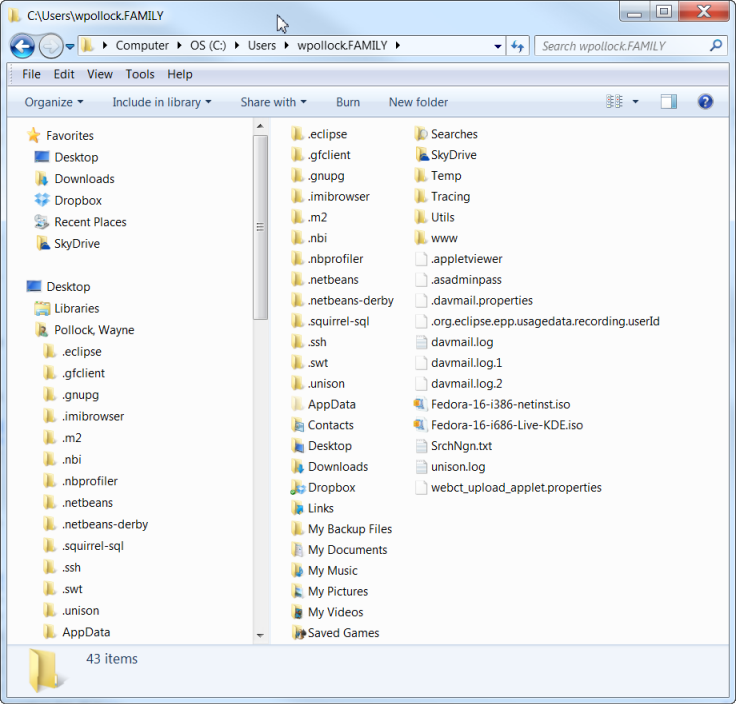 For Windows 7, open the Explorer program, select the Tools -> Folder Options File Types tab. You get a list of all file types that are registered with Windows. You (or a program that you install) can modify these associations. Which program is associated with the extension .html? Which program is associated with the extension .gif? 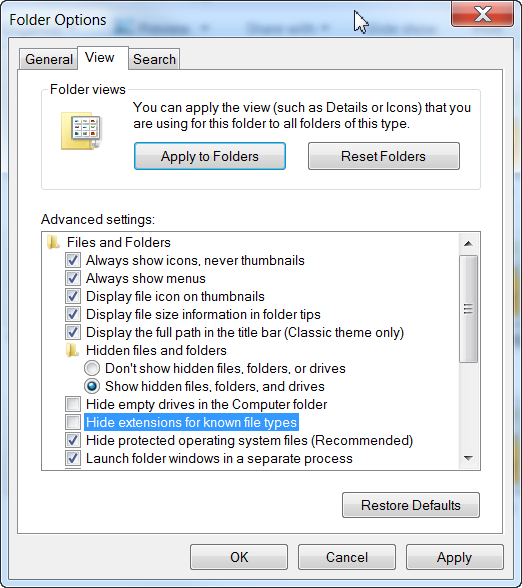 Items such as file and directory icons in the Explorer display have context menus that contains commands directly related to the item. This menu can be displayed by clicking on the object's icon with the right mouse button. One of the most useful entries in the context menu of a file is Rename. To rename a file, right-click on the file, select Rename and type the new file name. What are the commands listed in the context menu for the c: drive? What are the commands listed in the context menu for the c:\yourname\tutorial\sample.txt file? Files and directories often need to be copied. There are two methods for copying files with the Explorer program. The most intuitive method is drag-and-drop: select a file with the mouse, drag it to another directory, and drop it. 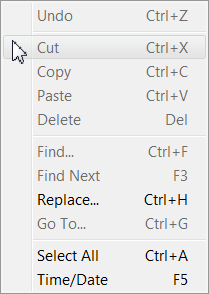 If you hold down the Ctrl key while dragging the file, it is copied, not moved. With some manual dexterity, you can also drag a group of files. To select more than one file, depress the Ctrl button and click on all files in the group. For selecting multiple files with similar properties (such as the same extension, or similar modification dates), you may find it helpful to switch to a tabular view (menu option View -> Detail). Depress the Shift button and use the Up and Down arrow keys to select a contiguous set of files. The difficulty with drag-and-drop is that both the source and target directory need to be on the desktop. You can overcome that problem by cutting and pasting files. Select the files you want to move or copy. Then select Edit -> Cut (or simply Ctrl+X), move to the directory into which you want to move the files, and select Edit -> Paste (Ctrl+V). To copy the files, use Edit -> Copy instead. Computers are fairly reliable, but their parts do have a finite lifetime. Also, important files can sometimes be destroyed by careless computer users. You should make it a habit to back up all important files. Your instructor will likely not accept "The computer ate my file!" as an excuse for late or missing homework. In ancient times, floppy disks were used to back up data. However, floppy disks are actually more fragile than hard disks. Also, the disk drive alignments of different computers can vary, sometimes so much so that it becomes impossible to read a floppy disk that was written on another computer. It is best if you use floppy disks as a matter of last resort. Today, various removable disks (including Flash drives) can be used through the USB port on your computer. On your own computer, a convenient backup method (as of 2003) is a CD burner. Windows has a rudimentary feature set for burning CDs. You can insert a blank CD, drag files onto it, and burn the CD. However, some computer manufacturers preload software that offers a different interface to the CD burner, and older versions of Windows require a separate programs for CD burning. Since the details vary widely, we cannot review the process in this tutorial. The best method for backing up your work from a computer lab is an online service such as Dropbox. You can save files on an external server and load them back either onto the same computer (in case you need to restore a lost or corrupted file), or onto another computer (in case you need to move your work between your lab and home computers). Back up the file c:\yourname\tutorial\sample.txt, either onto an online service or onto a flash disk. Describe the steps that you took. Now delete the file and restore it from your backup. What steps did you take to restore the file? Try doing that in a GUI. If you take a screen capture of a folder display, all you get is a bunch of pixels. If there are many files to process, such an operation would be very tedious with a GUI. Many worthwhile tasks are never attempted by GUI users just because they don't know how to automate them. You can type commands interactively in a console window, or you can save your commands in a file. Then later, you can re-run those same commands just by running the file. A file of console, or shell (or DOS) commands is called a script, or (for DOS), a batch file. The command shell has a rather primitive user interface. 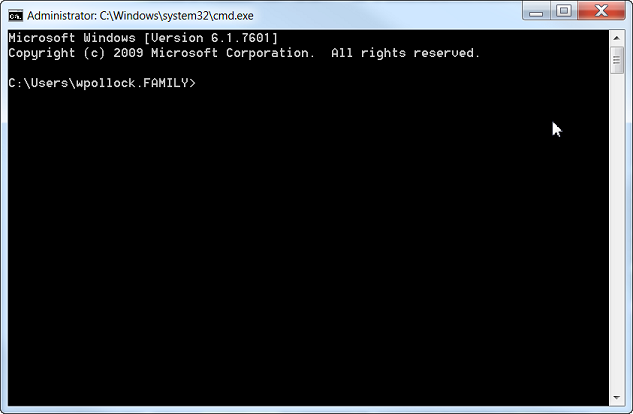 A prompt shows the current directory, such as c:\windows. You type a command and hit the Enter key. The command is executed. Its output is displayed in the shell window. Another prompt is then displayed, and the process repeats until you close the shell window. Using the command line, you must always type in the command name first. If you want to open a document, you must list the name of the command used to open it, first. Separate the command name from any file name(s) by one or more spaces. Another issue is remembering that the filename always includes an extension. By default, many versions of Windows won't show the complete filename when using the GUI. The final period and trailing letters, known as the extension, are not shown. (Instead, the file's icon is supposed to indicate the file's type.) When creating a file from the GUI, a default extension is usually added to the name you specify. From Notepad, the default extension is “.txt”. So when you save a file with the name “Hello” or “Hello.java”, you may actually be creating a file called “Hello.txt” or “Hello.java.txt”! The “dir” command will show you the real, complete filename. If that name isn't what you want, you must rename the file. See this Microsoft support note for directions to set Windows Explorer to show or hide file name extensions. What prompt is displayed when you open up a command shell window? You should just type “dir”, and then hit the Enter key. (Nothing will happen until you hit the Enter key!) If you don't get the output you expected, make sure your prompt is similar to the one in the example. followed by the Enter key into the shell window. You will see a listing of the files and directories in the current directory. How many files are contained in the current directory? How many directories? What does the prompt string look like now? What files and directories are contained in the root directory (of the C: drive)? Typing cd plus a path changes the directory to the given path. Here a path can be relative to the current directory or absolute. Absolute paths always start with the root directory (\). Relative paths begin with a file name in the current directory. There is one special file name that is very useful: the double period (..) refers to the parent directory of the current directory in the directory tree, so that it is possible to go up the tree with relative paths as well as down. Similarly, the filename . refers to the current directory, but that abbreviation is not commonly needed. cd "\Program Files\Microsoft Analysis Services"
Sometimes, The Windows command line will guess that you meant to quote the name; this is because some commands only accept a single file name as an argument, or don't treat spaces as delimeters. When in doubt, use quotes around filenames with spaces. It is usually best to avoid spaces or other unusual characters in file names. Some people dislike using the command shell because it is tedious to reissue commands that were mistyped. Fortunately, it is possible to retrieve and modify previously issued commands. Hitting the Up and Down arrow keys cycles through the commands that you already typed. What command do you see when you hit the Up arrow key? What command do you see when you hit the Up arrow key again? NOTE: If the arrow keys don't retrieve old commands and you run Windows XP, double-check that you are running cmd and not the older command shell. If you have an older version of Windows, you need to run the doskey program to enable command line editing. Simply run doskey after you open a command shell. Type c and the F8 key. Hit F8 repeatedly. What happens? The F8 key performs a search of the previous commands that start with the text you have already typed. This is often the fastest method for retrieving an old command. You can use the cursor keys (Left,Right, Home, End) to edit the line that you called back. Move the cursor where you want it and insert or remove characters. If inserting characters types over existing text, hit the Ins key to switch from overtype mode to insert mode. Type cd \windos (note the misspelling). After you get an error message, use command-line editing to fix it to cd \windows. What are the key strokes that you used? Another very useful feature of the shell is filename completion. If you type a part of a filename and hit the Tab key, then the first matching file is displayed. Hitting Tab again cycles through all matching completions. Type cd c:\w and hit Tab. What happens? NOTE: Filename completion only works with Windows XP. It does not work with older versions of Windows. Finally, if you look for a command and you don't find what you want, you can clear the command line and start over by hitting Ctrl+C. Indeed, this command can be used to stop almost any action that is still in progress. NOTE: When you delete a file with the del command, it does not get moved into the trash can. It is deleted for good and cannot be retrieved. copies the file sample.txt and names the copy sample.bak. How would you achieve the same effect using the Explorer program? copies the file sample.txt into the directory a:\. Because the target of the copy command is a directory, the copied file keeps the same name. moves the file sample.txt to the directory a:\, removing the original. renames the file sample.txt to sample.bak. How would you achieve the same effect using the copy and del commands? Execute these commands. What is the full path name of the backup directory that was created? You remove a directory with the rmdir command. However, in order to be removable, a directory must be completely empty. That is, you must first remove all files and directories that it contains. What error message do you get? How can you remove the directory? Often when we want to copy files, we only want files of a certain type (that is, with a certain file extension). For example, we may want to copy only text files (with extension .txt). We use the wildcard notation for this purpose. copies all files whose names end with .txt to the a:\ directory. How would you copy all text files from the c:\windows directory to c:\yourname? Why is this a better solution than the one you found in exercise 19? The string s*.txt matches all files beginning with the letter s and having the extension txt. The string st??.ba? matches all files beginning with the letters st whose filenames have four characters, and whose extensions consist of three characters beginning with ba. Use the dir command and wildcards to find all files in C:\windows that start with a w, have three letters, and whose extension is ini. What command did you issue, and what matches do you get? Many shell commands take options that modify their behavior. for a wide listing of the Windows directory. Another useful option of the dir command is /p. Try the command dir c:\windows /p. What is the effect of the /p option? In general, an option to a command starts with a forward slash, followed by a letter. Note that forward slashes (/) are entirely different from from backslashes (\), which are path separators. Most commands have several options, which you can find in the online help. What are all options of the del command? NOTE: In Linux/Unix/Mac OS X, you use a dash, not a forward slash, for options. For example, ls -a. Sometimes, you need to copy information from a command shell window into another window (for example, to include output in a report or email). Unfortunately, this process is somewhat cumbersone. Right-click on the command shell window. A context menu pops up. Switch to another program (such as Notepad) and paste (Ctrl+V). Obviously, this method can only be used to copy a single screen to Notepad or another application. To get more than one screen, you will need to use redirection, which is described in the advanced lab. Conversely, you may want to copy a command from another program (such as a web browser) into the shell window. Copy the command, then right-click on the shell window and select the Paste option. into the shell window and execute it. What happens? You can also provide command-line arguments. For example, to launch the notepad program and edit a particular file, simply specify the file name. When you give the name of a command, then Windows tries to find an program file with that name. 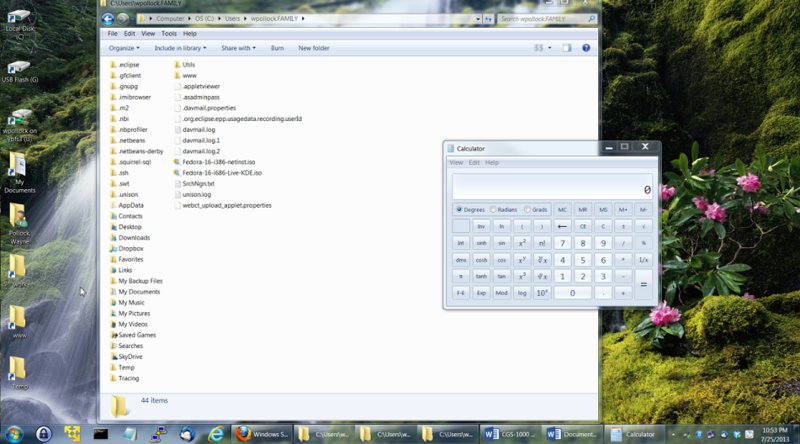 For example, when you type notepad, then Windows looks for the file notepad.exe. It looks for the program file in the current directory, then in a set of standard places that include the c:\windows and c:\windows\system32 directories. If the program file is not found, then an error message is displayed. Notice the “More? ” prompt, which shows the line is a continuation of the previous one. A line can be broken at any point, even in the middle of a word. (Note the misspelling). What happens? Explain. Instead of changing PATH or other environment variables using the command line or Windows standard GUI, you should try a free replacement tool such as Rapid Environment Editor. If some command line program is taking too long to complete, you can abort it by typing control+C (that is, pressing the control and letter C keys at the same time, then releasing both). Alternatively, simply close the shell window. There are references to these commands online at go.microsoft.com/fwlink/?LinkID=91473 and ss64.com/nt/. Microsoft includes several command interpreters, or shells, in addition to the traditional DOS command line. These include vbscript, wscript, cscript, and PowerShell, among others. wscript is the same as cscript, except cscripts open a console window (or run in one), like DOS scripts. Wscript won't open any console window by default. PowerShell is designed for various heavy-duty (system administration) tasks, that might normally require a GUI application. This guide only covers basic DOS scripts and commands. However, here are two examples of wscript, to show a bit of the power of those additional shells. “wscript” is short for “Windows Script Host”. It can be used to display messages in a GUI window, change environment variables, drive-letter mappings, or even registry settings. Such scripts are text files, generally with the extension “.vbs”. To run this example, either double-click on the Hello.vbs file, or enter its name from the DOS command line. You could use a script like this, along with the Windows task manager, to pop-up a reminder message at a certain time. Or you could use such a script to notify you when some long-running task completes. When you double-click this file, it will run example.bat without opening any console window. This is useful to avoid extra taskbar buttons, for applications and servers such as Apache Tomcat, Unison, or MIB Browser, that are launched from batch files. You can put a short-cut to such wscript files on the Start menu. For more information about wscript and cscript (among others), see http://msdn.microsoft.com/en-us/library/9bbdkx3k(v=vs.84).aspx (Windows Script Host). For information about PowerShell, see http://msdn.microsoft.com/en-us/library/windows/desktop/dd835506(v=vs.85).aspx, and http://msdn.microsoft.com/en-us/library/windows/desktop/ms714469(v=vs.85).aspx.